(From left) Jacinto Fragoso, Alea Meyer, Jennifer Hwang, Katlynn Klein, and Mariah Cheyney. 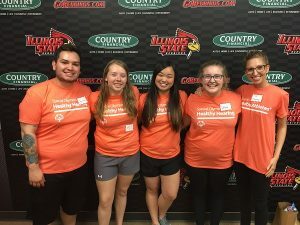 Several NIU Audiology students recently volunteered to provide hearing screenings to Special Olympics athletes. Joining forces with students from Illinois State University and Rush University to conduct the screenings in Bloomington, Illinois. These screening attempt to bring to light any audiological or ear problems that athletes may be facing and, if present, to refer them to appropriate audiological care. The NIU chapter of Student Academy of Audiology also applied and received the Special Olympics Healthy Hearing Grant ($250) from the American Academy of Audiology Foundation earlier this spring to cover travel and other related expenses for volunteering in Special Olympics. Special Olympics is the largest global public health organization dedicated to serving individuals with intellectual disabilities, providing free health screenings and health information to Special Olympics athletes at local, regional, and world games.